The lovely summer tomato, what could be better sliced thickly and served up on a sandwich or as a side? Begin planning now for better tomatoes. There are good cultural practices which can be used in your garden to prolong the life of your tomatoes into the summer. The first step is to carefully consider choosing varieties, also referred to as cultivars, which have resistance to disease. Many of our preferred tomato cultivars that we plant in our gardens are heirloom varieties which are very susceptible to disease and often die by late July. There are tomato cultivars which have been developed at the NC State University Mountain Horticultural Crops Research and Extension Center in Mills River by Randy Gardner, Tomato Breeder and Professor Emeritus, Horticultural Science with disease resistances to late blight, Fusarium wilt race 3, and tomato spotted wilt virus. The breeding program, currently led by Dilip R. Panthee, Ph.D. Is also breeding for horticultural traits including earliness, large fruit size, firmness, color, flavor, smoothness, crack resistance, shelf life and high temperature fruit set. Combinations of quality features and disease resistance are sought in a variety of types (large-fruited, Roma, cherry, grape) and in red and yellow fruit colors in the breeding program. Some of the varieties available from the breeding program are ‘Mountain Glory’, ‘Mountain Magic’, ‘Mountain Majesty’ and ‘Mountain Pride’ for slicing tomatoes. Other varieties with some disease resistance are 2 cherry types ‘Sun Gold’ and ‘Mountain Belle’. A plum type with disease resistance is ‘Plum Crimson’ and a grape type with disease resistance is ‘Mountain Honey’. If you save seed from heirloom types, such as a ‘German Johnson’ or ‘Cherokee Purple’, it is recommended that you make sure the seed is clean of any disease inoculums, which easily overwinters on seed. Threat the seed by dipping it in a solution containing 1 quart of household bleach and 4 quarts of water plus one-half teaspoon of mild dish soap for 1 minute. Constantly stir the solution and then wash the seed in running water for 5 minutes and dry the seed thoroughly. The final rinse should be done with a gallon of water with 1 ounce of vinegar. Dry the seed after the final rinse. Consider the nutrition requirements of tomatoes and how you will meet those to keep the plants healthy. Hopefully you are using your soil test report to determine how much fertility to add to the soil for tomatoes. Soil test kits are available at our office between the hours of 8:00 a.m. and 5:00 p.m. and testing is free from April 1 until November 30. Be sure to plant tomatoes when the soil has warmed to 60 degrees Fahrenheit, the appropriate temperature for healthy root growth. In our area, this will depend more on the weather and less on the calendar date, although most tomatoes will be set as transplants from mid April to mid May. Choose healthy transplants that are not showing signs of disease or insect pests. It is best to choose plants that are not blooming and are not root bound in the container. Do not plant your tomatoes where other plants in the Solanaceae family were planted within the last 2 years. By rotating crop families, you can help to break disease and pest cycles associated with the soil. Eggplants and Peppers are other solanaceous plants often grown in our summer gardens. Plant tomatoes spaced at least 2 feet apart so that there will be good air flow to aid in pollination and drying of leaves after showers and heavy dew events. Trellis your tomatoes on sanitized stakes or cages. Plan to prune your tomatoes by suckering them and removing leaves below fruit set. Make sure the plants are receiving at least 1 inch of water a week during the growing season. Only water your tomatoes at the base of the plant. Drip irrigation or soaker hoses can be used to aid in proper watering technique. If disease symptoms appear, remove the plant parts showing signs of disease and dispose of them in the trashcan. You may need to rogue out entire diseased plants, including the roots, to protect the rest of your tomatoes. Mulch your tomatoes to cover the soil, to protect against soil splash, to suppress weeds and to maintain soil moisture. Organic materials such as wheat, fescue, or alfalfa straw can be used. Many produce farmers use plastic mulch with drip irrigation to create optimum growing conditions for their tomatoes. There are new biodegradable mulches available which can be used. Plan to regularly scout your tomatoes for the presence of insect damage and signs of disease. Using Integrated Pest Management (IPM) is a systematic way to manage pests. Many small insects like leafhoppers are vectors for viral diseases. Rather than listing insects and diseases which could be possible pests and then matching them with a pesticide, Cooperative Extension promotes a system of pest management called Integrated Pest Management or IPM. IPM is an approach that uses knowledge about pests and their life cycles, cultural practices, nonchemical methods and pesticides to manage pest problems. It is recommended that you start with prevention in mind by doing all of the good cultural practices that you can to minimize the incidence of pests. Good cultural practices such as choosing disease-resistant varieties, using soil test results for fertility inputs, planting in well-prepared soil at the proper time, and watering properly will go a long way in reducing pest problems . The IPM steps that are followed in a systematic way along with using good cultural practices in order of practice are next using mechanical and physical tactics for prevention, third, using biorational insecticide or fungicide applications prior to outbreak status. If you wait until outbreak status when you have an infestation of insects or a full-blown disease taking the plant down, you may need to use a more persistent pesticide for control. Pesticides which are persistent are more long lasting in the environment and typically do not readily biodegrade. Biorational pesticides are less persistent in the environment and do biodegrade. Some of the insect pests you are likely to see on tomatoes are flea beetles early in the season, Colorado potato beetle if you are also growing a lot of potatoes, tomato fruit worm, armyworm, tomato pinworm, stink bugs, thrips, white flies, and mites. Be sure to keep weedy borders mowed and plant flowers to attract beneficial insects which will prey on some of the pests. Thoroughly scout fields and spray only when necessary. For flea beetles, use insecticidal oil, neem, spinosad, or parasitic nematodes as a soil drench. For Colorado potato beetles, use neem oil, spinosad, and pyrethrin for larval control. For tomato fruit worm, also known as the corn earworm, use insecticidal oil, neem, Bacillus thruringiensis, insecticidal soap, and Chromobacterium (Grandevo). For armyworm, including beet, southern, and yellow-striped armyworm, use spinosad, Bacillus thruringiensis, Chromobacterium, Spod-X, and kaolin clay as a repellant. For stinkbugs use Chromobacterium, insecticidal oil, and pyrethrin. For thrips use spinosad, insecticidal soap, and paraffinic oil. For white flies use neem oil, insecticidal soap, and Chromobacterium. Always read the product labels and follow the exact directions for amounts and timing of applications. Remember, using pesticides is the last step in the IPM system. 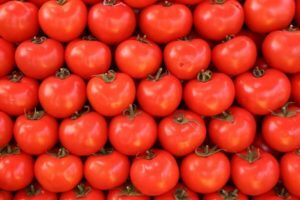 Diseases you may encounter with tomatoes are bacterial canker, bacterial spot and speck, early blight, late blight, powdery mildew, septoria leaf spot, southern blight, and tobacco mosaic virus. Some strategies to use to prevent disease are to use resistant varieties, use disease-free see and transplants, rotate crop families, control solanaceous weeds, use cover crops the season before, destroy crop residue, rogue out diseased plants, promote good air flow by using the proper spacing, do not handle plants when they are wet, water at the base of the plant and ensure that proper fertility is provided based on soil report. Biorational fungicides for use are Bacillus subtilis (Nutria organic control), copper products, lime-sulfur, paraffinic oil, potassium bicarbonate, neem oil, and sulfur products. It is recommended that you alternate the fungicide that you use to avoid the development of disease resistance in the causal organism.